Do you have a few minutes or a few hours to volunteer? We have ways to serve that make sense in your world and fit into your schedule. Are you looking for ways to engage your employees to serve others? We work with business leaders to design a customized project to support families whose child has special needs or a serious illness. Contact us for more information. Would you like a missions opportunity to involve members of all ages in your congregation? We love connecting with churches to shine the light of Christ. Contact us for more information. Are you a student or a teacher who would like to host a change drive or a volunteer project to help us spread hope, love and joy? 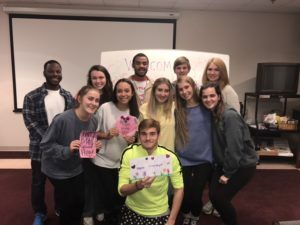 We have multiple teams of students who leading Links of Luv clubs on their campuses. Contact us for more information.